Today, the site of the former bishop's palace occupies an east/west orientated site under the care of English Heritage and mainly falling within the modern boundaries of Palace Farm (c1695) in Rock Road, a little to the south of the town. Documentary evidence regarding the palace is at best sketchy. We know it was established about the year 1080 and existed as an episcopal rural residence until no later than the 1530s, a period of some 550 years. Any old building that survives today will have seen many architectural styles pass it by and usually the structure exhibits an amalgamation due to the tastes and needs of the occupiers. Records say little about the palace and what we can imagine is that what was first erected in 1080 bore little resemblance to that which was standing in the 1530s. At the beginning the buildings would have exhibited much Norman work – the Conquest having occurred only fourteen years before – and later with successive bishops their tastes and styles would have been incorporated. The timeline that follows begins 171 years before the palace was established in order to give and idea of those distant times, of the events prior to its foundation and how the lands at Chudleigh became originally linked with the church and bishops of Exeter. 909 The See of Crediton, Devon was created out of the See of Sherborne, Dorset. The 'see' being the seat of the bishop, in other words his cathedral. 932 English King Athelstan founded an abbey church at Exeter and dedicated it to SS Mary and Peter. 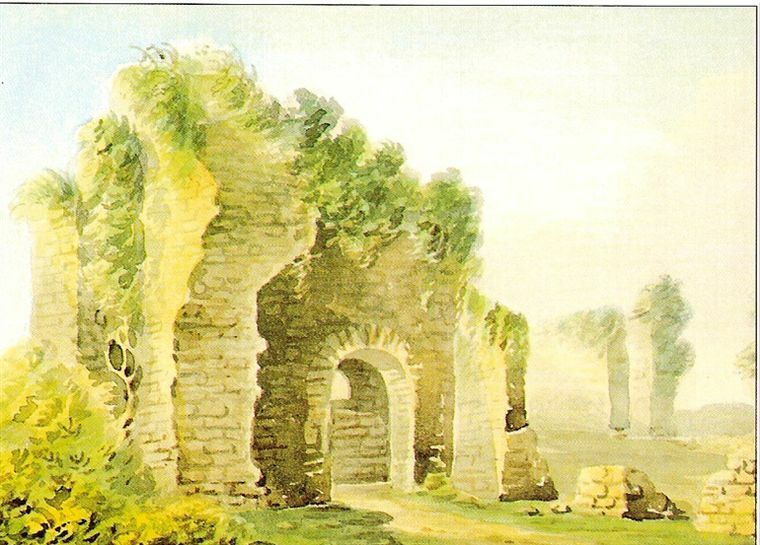 It is probable that from this date the lands at Chudleigh came into the possession of the abbey church having previously been held by the king. Most of the richest lands in Devon had previously been taken by the Saxon kings when they conquered Devon in the seventh century. Athelstan died in the year 939 and was buried in Malmesbury Abbey. 1001 The year of one of the raids on South Devon by the Danes. Although there are no specific records relating to Chudleigh we know that they sailed up the Teign Estuary, burnt the royal village of Kingsteignton, and plundered it and many other manors nearby. It was on this occasion too that the Danes besieged the city of Exeter and two years later returned to the city and on that occasion destroyed the abbey church. 1019 Danish King Canute endowed a new abbey church at Exeter to replace the one destroyed by Sweyn and confirmed by charter their lands and privileges to the monks. Canute died in the year 1035. 1050 Bishop Leofric moved the See from Crediton to Exeter after seeking permission of King and Pope. His reasoning was that Exeter was more easily defended, already having its encompassing walls, built originally by the Romans. It was with his episcopate that Exeter first assumed the rank of a cathderal city. 1066 The Norman Invasion of England – Battle of Hastings 14 October 1066. Feudal System introduced. All land and property formerly held by the Saxons passed to King William, Norman landlords, bishops and soldiers. 1072 Bishop Leofric died and was replaced by a Norman bishop. 1080 Bishop Osbern Fitz-Osbern, a Norman by birth, was educated in England and became bishop in 1072. 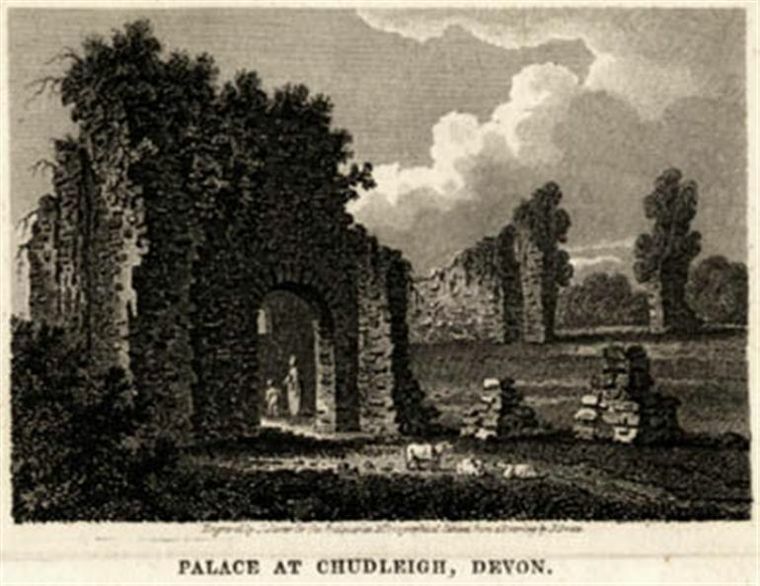 The Chudleigh palace was established about the year 1080. Little documentation survives describing the palace but from what little remains we can be sure the property was quite substantial also including a chapel dedicated to St Michael. The palace was used for official business, as a rural retreat and as a convenient stopping place when the bishop was undertaking visitations at Chudleigh and other nearby parishes. 1086 King William (the Conqueror) instigates the Domesday Survey. The survey includes TAINTONA in the Hundred of Esseministra (modern Exminster). This holding is described as including 'Chudleigh Park (the lordship) with the Town and Manor of Chudleigh, including Bishopsteignton, Luton, Combe and Ashwell, West Teignmouth and Teignmouth Courtney'. The enclosed acreage was 4770 and its 'value by weight' was stated to be £24. The Manor of Chudleigh, one of many in the south-west belonging to Bishop Osbern would have been given to Exeter Abbey by one of the Saxon kings long before. When the cathedral was refounded out of the abbey in 1050 its endowments passed to the Bishops of Exeter. 1100 At this point the bishop ruled over all territory between Somerset and Land's End. His estate included rural palaces at Paignton, Bishop's Tawton and Bishop's Teignton in addition to the one here at Chudleigh. Only the king and Baldwin the Sheriff had greater estates than the bishop in Devon. Bishop Osbern died in 1103. 1107 Bishop William Warelwast, nephew of William the Conqueror. It was this bishop who commenced work (1112) on the cathedral that can be seen in Exeter today with its magnificent Norman transeptal towers. The old Saxon abbey church was demolished in about 1133. Records are silent as to whether he made any alterations to his palace here. Warelwast died in 1136. 1161–1184 Bishop Bartholomew Iscanus, a native of Exeter and of humble birth. Documents of his period mention the bishop's park and wood at Chudleigh. 1259 Bishop Walter Bronescombe, a native of Exeter, bacame bishop in 1257. On 6 November 1259 he dedicated Chudleigh parish church, having spent ten days at the palace that year. He died in 1280 and his tomb is preserved in the Lady Chapel at Exeter Cathedral. 1282 Bishop Peter Quivil (Bishop of Exeter 1280-1291). At this date the Chudleigh manorial rights were annexed to the precentor and as part of this he was granted a house at Ugbrooke. In return he was responsible for collecting the rents and fees due from the manor inhabitants that were payable to the See. 1309 The year after being instituted as bishop, Walter de Stapledon acquired from Edward II a charter to hold a market and fairs. This effectively turned Chudleigh from a village to a medieval borough. It was this bishop that was responsible for the construction of the magnificent bishop's throne at the cathedral. It was constructed from oak taken from his woods at Chudleigh. 1317 Bishop Stapledon spent 'some weeks' at Chudleigh. 'In the register of Bishop Stapledon, we find the rental of the manor, in the year 1308, to be £17 4s 51/2d. About this time the woollen trade was carried on extensively, and the Fulling Mill paid 20s. per annum to the see of Exeter. For the collection of rents and other business connected with the manor, the precentor was provided with a house and certain lands at Ugbrooke, by the liberality of the bishops. In the will of Hugh de Hyckeling then precentor, dated Angust 8, 1415 and proved 1416, there is a bequest of money and of his live stock at Ugbrooke'. 1327 Bishop John Grandisson has sometimes been called the most magnificent prelate who ever filled the see. Born at Hereford he was nominated directly by the by the pope and consicrated by him at Avignon. His tenure as bishop, forty-two years (1327-1369) is considered to be one of the most memorable chapters in the history of Exeter. From his published registers (3 vols) it can be seen that he first came to stay at his Chudleigh residence on 28 June 1328 and stayed for the next eight days. He was responsible for significant architectural works at the cathedral and for making improvements to the piped cathedral water supply (1346-48). He founded Kings School, Ottery St Mary and financially supported many parish churches in the south-west. The Black Death (1348-1349) occurred during his episcopy and the bishop fixed his residence at Chudleigh for the whole duration of the plague. Chudleigh is recorded as losing one incumbent at that time. Again from his register we can see that Bishop Grandisson spent the last twenty years of his life at his Chudleigh residence. His will, dated at Chudleigh, on 8th September, 1368, was proved ten days after his death, an event that occurred on 15th July (the Feast of St. Swithin), 1369, in the 77th year of his age. He bequeathed the two largest bells in the palace belfry to the parish church. He was buried in the chapel of St Radegunde in the cathedral but his tomb was desecrated at the time of Elizabeth I. 1420–1455 Bishop Edmund Lacy is described as 'A working diocesan bishop'. According to Mary Jones it is 'tradition' that ascribes the town leat or pot water to Bishop Lacy that ran from Oxencombe Spring to the palace. However it seems reasonable to assume that the work was first instigated in the latter 1320s by Bishop Grandisson, particularly as he had been involved in such a scheme at Exeter (see above). 1447 Bishop Lacy appointed 'a custodian of the park and bailiff of the manor of Chudleigh for life'. Edward Pyry, who was keeper of the park was appointed with a salary of 12d. a week. 1519–1551 Bishop John Veysey was born at Sutton Coldfield, Warwickshire in about 1462 and he was in his early 50s when consecrated as Bishop of Exeter. During the winter of 1519 Bishop Veysey made the visitation of his diocese, he was at Bodmin on 24 February 1520 and a month later held an ordination in Exeter Cathedral and also another at St. Michael's Chapel at the Chudleigh palace on Easter eve, 7 April 1520. In the early part of his episcopate, he spent a portion of every year in his diocese, but at a later period his absences were long and frequent, and its management was left to grand vicars and coadjutor Bishops. In 1521 his reigster records that he was spending time at 'my manor of Old Windsor'. 1523 It is recorded that the palace buildings were in a state of disrepair and neglect, this seems to be due to Veysey's absence from the area. For example we know that on 30 March 1533, he officiated with the Bishops of Lincoln and St. Asaph at the consecration of Thomas Crammer. At the time of Veysey's bishopric the See of Exeter was possessed of twenty-two manors and fourteen well furnished residences. All were taken away at the time of the Reformation except the Exeter Palace. However even though valuable manors were given up he reserved a annual rent-charge of £42 per annum on the manor of Chudleigh and that annuity continued to be paid to the Bishops of Exeter by the Cliffords for many years afterward. 1533–1551 Bishop Veysey spent little time in Exeter or Devon in this period and the management of his See was left to others. These persons likely had little interest in Chudleigh and in some part likely contributed to its lack of use and neglect. From 1546 the manor was no longer held by the Bishop and no doubt the lessor and later owners as non-residents (see below) were only interested in the income they could derive from it and likely never set foot here at all. 1546 The Manor of Chudleigh was leased to Edward Seymour, the 1st Duke of Somerset, this included the old palace and grounds. 1550 The Manor of Chudleigh was leased to Thomas Bridges of Tangley, Oxon. This included the palace, town and park. 1551 In this year Bishop Veysey was deprived of his See and was granted a net pension of £485 9s. 3d. Retiring to his birthplace, he spent his income in works of charity. He rebuilt the aisles of the parish church of Sutton Coldfield and added to its ornaments; he erected a market-place there, paved the town, re-edified the street, defrayed the cost of two stone bridges, gave a meadow for the benefit of poor widows, founded a grammar-school and introduced the manufacture of "Devonshire kersies". On the death of Edward VI in 1553 he was reinstated as Bishop of Exeter. However he soon returned to Sutton Coldfield and died there on 23 October 1554. He was buried in the parish church there. 1597 The old palace and lands were purchased by James Eastchurch of Lawell from Thomas Bridges, the grandson of Sir Thomas Bridges who at some stage in the interim forty-seven years purchased the property having originally only held the leasehold. From Polwhele's History of Devon (1793-1806): "The chapel at the barton of Place (it is said) belonging to the Wolcombes. The walls of which were marble, was sold to neighbouring farmers, in order to be burnt to lime." Note that the marble to which Polwhele refers was unlikely to have been true marble but the local limestone that could be worked to a high polished finish. This Palace was a favourite residence of the bishops of Exeter before the Reformation. In its episcopal chapel, dedicated to St. Michael, many ordinations were held, and many acts of the bishops performed. In the Chapel of the Palace, Bishop Lacy admitted one Thomas Cornysshe to the profession of a hermit. As fish formed a regular article of diet, the establishment had its fishpond which was situated in Pond Meadow near the building. It is only a few years since that the ancient flour mill was pulled down, and a new house built on its site. The flour mill was the necessary accompaniment to ecclesiastical establishments, as the early bishops and abbots had frequently to supply the wants of the poor, as well as to provide for their own numerous retinue. The burial ground lay in the eastern corner of the orchard, where some skeletons were dug up when the road to the quarry was recently widened. A well and spring, in the vicinity of the Palace, still retain the names of Bishop's Well and St. Mary's Spring. All that remains of the Palace are a few crumbling walls, some steps, and a portion of three apartments arched over with heavy stonework. These are now thatched and converted into cellars for the use of the farm. In a line with the Palace, and separated from it by an open area, was the Chapel. These buildings were connected on the west by a high wall which enclosed the area. A corner of the wall of some height and great thickness is all that now remains of the Chapel. The most perfect part of the ruins are the boundary walls; that towards the south-west, has in it some arched loopholes at regular distances. Visitors to the old palace should be aware that the ruins lie on private land and prior permission should be sought before attempting a visit. However, a general view of the site may be had from Rock Road, the lane that passes by on its northern side.